with my new spellbinders edging dies. I used a precoloured image from "Fred she said". Poppies are a gorgeous flower and I think this image is gorgeous too. I used a sentiment from my pc and cut it with an xcut frame die. I used my new edging does... 2 of them together made this edge. and some martha stewart punched butterflies. Oh Vic, this is REALLY pretty! Awesome coloring and design! Thanks so much for joining us at The Sisterhood’s ‘BIRTHDAY’ challenge and please come back again soon! Such a beautiful card!! Thank you for joining us at Craftin Desert Diva's Birthday Linky Party!! An absolutely glorious creation Vic, great design to your card as well. I love poppies! Your flowers are just beautiful and I love the colors against the craft base of your card. Thanks for joining us at The Sisterhood of Crafters! This is stunning, Vic! Gorgeous coloring, and I just love the border and the butterfly. Great color combo with the kraft. Fabulous card with beautiful poppies. Great coloring on the poppies. Love your color choices. Thanks for joining the Sisterhood's "Birthday" challenge. This card is so elegant and precious.. love your coloring! Thanks for playing with us at CDD Linky Party! Hope you had fun! Beautiful these flowers and such great coloring! Thank you for taking the TIME OUT and join us! So pretty and such a fun bright card. Thanks for sharing with us at Little Red Wagon this week. Such a pretty card!!! 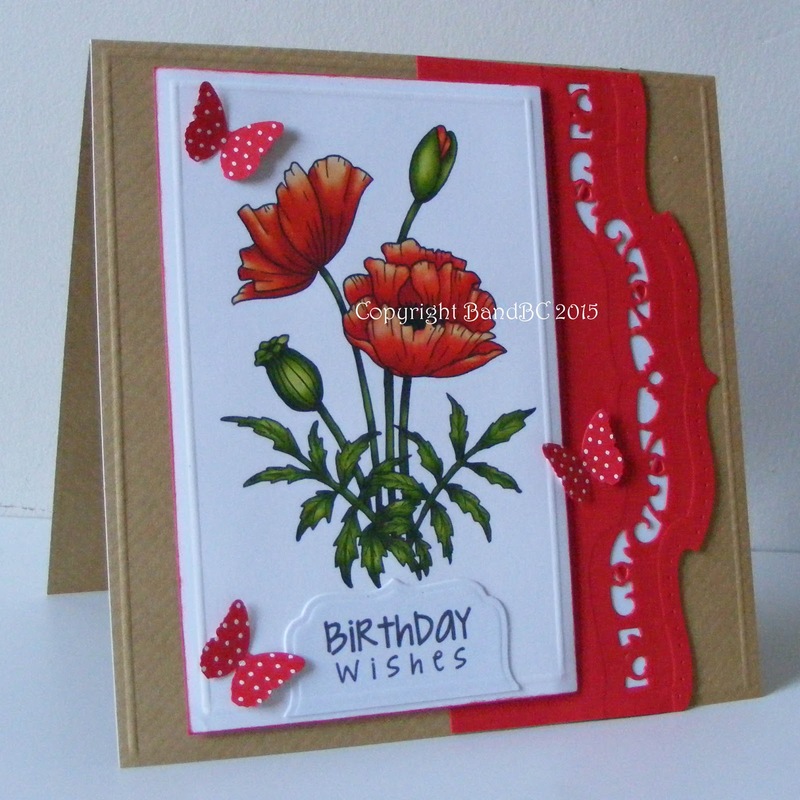 Love the addition of the red polka dot butterflies and the Kraft color with the red just makes everything pop! Thanks for linking up to Craftin Desert Divas Birthday Challenge! Thx for joining us at Scrapper's Delights challengeblog. Such fab composition. What a beautiful image and lovely color palette! Thanks for taking TIME OUT and joining our challenge! Congratulations on being the Top Award Winner here at the Sisterhood of Crafters. Beautiful work.